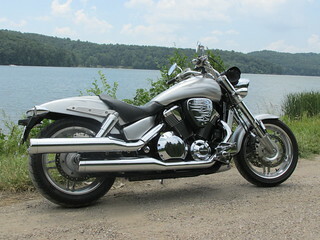 VTXOA > VTXOA Message Boards > New Member Introductions > New member with a hot rod VTX1800C! New member with a hot rod VTX1800C! Hey there! Been lurking on here for a while to try and gain some more info on these great bikes before I purchased an older used one. I’m not new to motorcycles for sure, but this is the most cc’s I’ve ever had on a bike. Just recently picked up an older, but barely used 2003 1800C. I got it from the original owner who only took it out a few times a year on short trips. He also sometimes used it for commuting to work, but he only had to travel a mile or so to work! He took really good care of the bike and kept up on service even though it didn’t really need it based on mileage, and he also dumped quite a bit of money into it when it was newer. Just under 5k miles, full cobra exhaust, Dynojet PC3 with dyno tuning, Corbin seat, 1.5” drag bars, Jardine forwards with mini floor boards, etc. I’m not a mechanic by any means, but I like to do a lot of the wrenching myself if time and capabilities allow. I have done several frame off jobs on vintage 70’-80’s bikes. I’m going to go ahead and probably due a full fluid change, just so I know for sure, and I need to change out the tires. They only have a few hundred miles on them, but they are almost 12 years old! Thanks for all the experienced help on here! I’ve been reading through the forums on different issues and repair/maintenance tips, and I did download the service manual. It’s still not quite full on riding weather here in Upstate NY, but we’re getting close hopefully! Curt E, StarrRider, steveroy60 and 1 others like this. Curt E, StarrRider and motox369 like this. Thanks! I don't believe it though haha... I spent some time out in Oceanside with my brother at Camp Pendleton. from southwest California to northern Washington state.. very few nice days..
not so much fun on a motorcycle.. 7,000 mile trip..
Big Larry has California VTX Riders site has good info. Curt E, StarrRider and DrDolittle like this. I've ordered some routine maintenance items to do like: oil/filter, brake fluid, differential fluid and a new FPR. I've already checked the main grounds on the bike, and I pulled the wheels to get new tires, so wheel bearings and flange check out OK. I ordered some Loctite Moly Past for reassembly of the rear axle and splines. I need to check the crankcase breather still, and I'm thinking I'll skip the coolant fluid flush for now. I decided to go with the new Avon Cobra Chrome for front/rear tires and keeping the rear at 200/16R16 like the original owner had on there. With only 5k miles on the bike, that list of "to do" items should put me in pretty good shape, right? Nice bike. I have same. They a beast.. Enjoy! Welcome aboard.